Look for a contest teaser somewhere in this November edition of the eNews to enter a drawing for a free membership or renewal! Early Online Registration for the next NCSM Fall Seminar in Seattle ends on November 18! The NCSM leadership seminar' theme is Building Mathematics Leaders: Coaching. The focus will be to help each participant become the agent of change and improve student achievement in mathematics through the vehicle of classroom and district coaching. Click HERE to see all the ways you can be involved in NCSM and to sign up to volunteer. In particular, consider volunteering at the 2019 NCSM Conference. Sign up HERE to volunteer for the 2019 Conference in San Diego, April 1-3. There are many different opportunities available. The next discussion forum for November/December will culminate with a webinar in January 2019 with Robert Berry, president of NCTM (date TBD). Want a chance to win a free year of NCSM membership (new or renewal)? The first 20 people who email Pat Baltzley with two pieces of information regarding the upcoming 51st NCSM Annual Conference shared in the November eNews will be entered into a drawing for a year membership or renewal. Good luck! How is your Mathematics Health? This past month I have received multiple emails about my health, my insurance choices, my exercise and more. Did I sign up for the correct health plan? Do I get enough or the correct kind of exercise? It started me thinking about our mathematics health. As leaders we provide help to so many people around us and what do we do for ourselves? Do we learn new mathematics or explore additional topics? What readings inform our practice? Who do we learn from to improve our mathematics health? An opportunity that no one has selected yet which could be designed to improve your mathematics health is to apply for the Teacher-Leader Professional Learning Grant.This is a partnership with NCTM and the application Is short and easy to complete with a little immediate action. The purpose of this grant is to provide professional learning assistance for mathematics teachers and mathematics teacher-leaders. For 2018-19, a grant of a maximum of $4000 will be awarded to an elementary, middle or secondary school. The professional learning is for mathematics teacher-leaders and/or mathematics teachers within a school or district. Professional learning must focus on one of NCSM’s previous signature initiatives, Formative Assessment, Digital Learning orAccess-Equity-Empowerment. Since we have not yet received an application, we have extended the deadline to DECEMBER 7. If you are like most of us, you are thinking “I could do something for my team with $4000 and I will get back to this soon.” Then the window of opportunity closes before you have had a chance to apply! Don’t let this happen to you a second time. Now you have chance to apply for this grant. We would like to see one of our mathematics teacher-leaders take advantage of this opportunity! Our NCSM website has information from previously awarded grants. This information and more can be found HERE. So, please take care of your mathematics health and apply for this opportunity to learn, rejuvenate your passion, and energize your practice. NCSM is busy preparing for the 51st NCSM Annual Conference! Whether you are a first-timer or a veteran of NCSM annual conferences, join us for three exciting days in San Diego CA, focused on important issues for leaders in mathematics education. Join us in San Diego, CA, April 1-3, 2019 where exciting opportunities await you at our 2019 Annual Conference! Description: In a practical sense, we know achieving equity in mathematics education can be a daunting task. Three areas of research have been prominent in mathematics education over the last 3 years: understanding and responding to implicit bias in the classroom through culturally responsive pedagogies; motivation theory in the classroom, including growth mindset and academic belonging; and, how the brain learns mathematics. All three areas of research point to a common nexus of need in the learner: to keep calm and learn on. In this session, Drs. Luis Lima and Catherine, and Doug Sovde will take participants through both an exploratory and practical experience in both understanding why things can go wrong in students’ brains and how to both prevent and adjust if they do. During this double-block, pre-conference workshop, you will learn how to leverage culturally responsive pedagogies, motivation theories, and learning science to creat learning enviroments conducive to students or educators. Have you been receiving the The Marshall Memo in your member email? This members-only benefit has been published 50 times a year since 2003, and is designed to keep principals, teachers, instructional coaches, superintendents, and other Pre-K-12 educators well-informed on current research and best practices. Kim Marshall, drawing on his decades as a teacher, principal, central office administrator, consultant, and writer, lightens the load of busy educators by serving as their "designated reader." Click HERE to access the Benefits of Membership page on our website and scroll down to access the Marshall Memo. 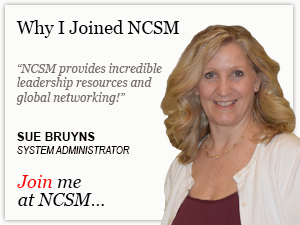 As you scroll, take note of all the other benefits of an NCSM Membership! NCSM is excited to share this wealth of current information with our members! Enjoy!